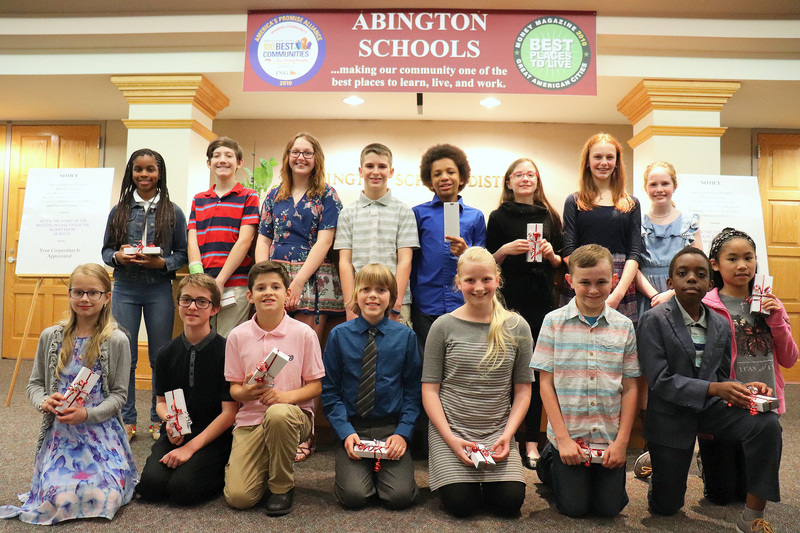 At last night’s meeting of the Board of School Directors, Abington School District’s curriculum department recognized the 16 recipients of this year’s “Silver Pen” awards, honoring outstanding student writers across the District’s seven elementary schools. Each year, sixth-grade teachers are invited to nominate a student for the annual awards program, based on his or her narrative writing selections, and then a special committee at each school scores the papers, with the highest-scoring students being named winners. 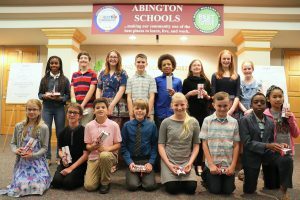 Thanks to grant funding provided by the Abington Educational Foundation — a non-profit organization that provides funding to enhance educational experiences and outcomes for Abington School District students and their families — the winning students received an engraved pen at the meeting from Supervisor of Elementary Communication Arts Dr. Kelly Doyle, and Board President Raymond McGarry, Esquire. The students will also have their names added to a recognition plaque at their respective schools.